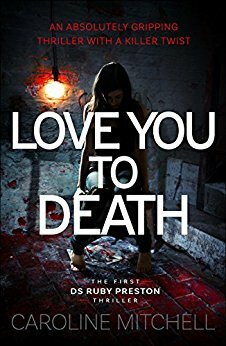 Love You to Death is a serial killer thriller packed with twists. If you like Karin Slaughter, Angela Marsons and Val MacDermid, discover Caroline Mitchell’s new series today – at a special launch price. Caroline Mitchell takes having mummy issues to a whole new level in this, what I believe to be her best novel to date. One thing that will hit you is the violence which is made more vicious when it is being powered by the rage of a young woman, Lucy. A very damaged young woman that seeks the perfection that fairy tales and happy ever afters are made of. Not very promising for her victims really. As this is a new series of course there also has to be a new detective so enter Detective Ruby Preston. Ruby is a cracking character that I feel is going to be a firm favourite of mine in the future. She is a real tough cookie that will get in there without thinking and have a go, but she also has a tender side that makes her need to be cared for at times too. Enter Nathan her childhood sweetheart. Talk about opposites attract but wow he is pretty cool for a bad boy. I really want to see where this goes in future books especially with the developments that took place. I was totally blown away with this novel which is edgy and a chill factor that you can’t make better with an extra layer of clothing. Top it all off with really gripping backgrounds on the main characters and you know then that this is going to be a top class series.